Charlotte Benson: Thank you, dear Gayatri Devi-ji, for answering a few questions for readers of the Jyotish Star. During this month of celebration of the centenary of your father, Dr. B. V. Raman, we want to hear a bit about him, from your familiar perspective. When did you discover your own interest, and abilities in Jyotisha? Did your father teach you how to calculate a chart and then instruct you in how to select a muhurta? Were you a willing pupil? Gayatri Devi Vasudev: First let me thank Christina, a pioneering figure in the Jyotisha movement in the West, and you for this interview on the occasion of father’s hundredth birthday. (August 8th) The very fact it is being celebrated here in the United States is testimony to the success of his efforts to propagate Jyotisha around the world. My interest in Jyotisha was initially confined to hearing father’s addresses on the subject in different fora. He made it a point to take me to all of his lectures. Seated in the front row with my mother Rajeswari Raman, I would listen avidly to his presentation of astrology as a scientific discipline and his spirited defense of it against the attacks of so-called rationalists who had mushroomed in Bangalore where father lived and did his work. And I would feel very proud of him. Sometimes, someone from the audience would “demand“ to know if father had predicted a certain natural calamity. I would feel very indignant at such questions and always felt they were unfair and unscientific though, I was, perhaps then, only in the 5th or 6th Standard. Not that I had any clear idea of either astrology or science at that age to be in a position to get angry with such questions. But I knew in my heart of hearts what father was saying was right and came from his conviction and the question should be shot at scientists with their long list of failures. It was more an emotional response, reaction rather, that got stirred in my heart than anything logical because I knew how hard father was working for astrology and how honest he was about it. I also saw some of these people who called themselves rationalists stooping to petty attacks and showing their contempt for astrology by sniggering after asking the question. This made feel very strongly for father and resolve in my heart that some day, I would show these people what father was and what astrology was. Of course, I had not the faintest idea on how I would do it, but I knew I would. In India, a rank means the top ten scorers in the University examinations. This seemed impossible to me as those days, one had to get a First class to get a rank; even if one was the topmost scorer and if one did not get a First class ( 60% and above) one would not be declared a ranker. Further, it was generally known that the University was very strict in giving First Class and so , where was the possibility of my getting a rank and I said as much to father but he brushed aside my arguments and said “ You will get a rank”. The University examinations were held sometime in March-April 1970 and the results were announced in the newspapers. What was my joy to find my name GAYATRI DEVI RAMAN – I RANK on top of the list? This really impressed me – not so much my exam result but more what father had said. And with this, my interest in Prasna or horary astrology began. Many years later I checked the planetary positions when father had said this and I saw Mercury, Venus and Jupiter in Virgo in the 7th from the Ascendant Pisces which had the Moon in it. I was still doing my law then and did not really start studying astrology then though this amazing astrological forecast made a very strong impression on my mind. I never asked father why he said that and if it was on Prasna or my birth chart. Father had to go to the United States and Europe on a lecture tour in September 1972. I had finished my law studies in April 1972 and was generally making myself useful in father’s office, helping him as an assistant. A week or so before he left on his tour, he called me to his office room and gave me a pile of papers saying “These are the articles for the next issue of the magazine. Go through them for technical and grammatical mistakes and correct them so that as soon as I am back, they can be sent to the press.” I felt a little confused and lost with that pile before me but I got down to work on the articles at the same time equipping myself with whatever I could studying from father’s books and old issues of the magazine. After his return, he went through the edited articles and seemed very pleased with my work and patted me on my back saying “You have done a good job. I knew you would do it” and with that started my career in astrology as I began to help and get more and more involved with father in his work. Though I had wanted to be a lawyer when I was studying law, this wish faded into the background as I now plunged full time into the study of astrology, sometimes working on the subject for nearly 16 hours a day. I started studying father’s books and how to draw a chart using tables. Since I had always done well in mathematics in my college days, I was able to learn to erect a chart and work out the other computations on my own but of course going by what was given in father’s books Hindu Predictive Astrology, A Manual of Hindu Astrology, Muhurtha, Asthakavarga and other books. Notable Horoscopes, in particular, fascinated me no end. About this same period father took me to a narrow lane in Basavangudi, a conservative suburb then, in Bangalore where he bought me copies of Pundit Subramanya Sastri’s English translations of Jataka Paritjata, JATAKA TATTWA and PHALADEEPIKA which I studied assiduously and which even now I make constant reference to in my work. I think we got these books from the Pundit’s children there. Though father was not a professional astrologer, many important people would come to him for guidance. At such times, he would ask me to look at their charts and jot down my findings on their concerns. This is how he trained me without personally coaching me in class-room-style but inducting me into the subject and its nuances. Likewise when a Muhurtha was sought from him for starting a big industry or sometimes, even a public sector undertaking or a marriage, he would ask me to work it out and take it to him. He would then tell me which factors needed to be given importance and what changes needed to be made in it. This way, I learnt the difficult art of electing Muhurtas. Whenever a big shot visitor was expected, I would draw a Prasna chart and try to figure out why they were coming. I would tell father why they could be coming and invariably it would turn out correct and father would be very pleased with me. Learning from father this way or just being around with him gave me a kind of peace and tranquility that nothing else did. I treasure those days and those wonderful sublime moments when I was with him. Charlotte: You pursued formal studies in both science and law. Your Dad must have been very confident of your natural talents, and energy, as depicted in your birth chart. After university, you were a real support to him in his Jyotisha work and publishing concerns? Gayatri Devi: Yes, I graduated in science and law and luckily did well in both. But after my law studies, when I was looking forward to register as a lawyer, father explained to me my chart (this was for the first time incidentally) and said because of the 9th lord in the 10th aspected by the 10th lord and Mercury in his sign of exaltation with Ketu, I could do well in astrology and since there were hardly any women doing it in our country, I could make good this lacuna. And he said, “Women will be more comfortable explaining their problems to another woman. Think about it”. I felt a little disturbed because I had done so well in my law studies and was looking forward to a career as an High Court or Supreme Court lawyer. And in this I was also encouraged by my law professors who were all very fond of me. Nevertheless, I bowed down to father’s guiding words and today, I have no regrets. As I progressed in my astrology studies and worked under father, I began to realize the great contribution he was making to Vedic Astrology and the fight he was putting up to restore it to its pristine glory and position. And I felt grateful to God that he had given this direction to my life putting me in the company of a Rishi-like soul instead of having to work in the sickeningly materialistic environs of law courts and legal disputes. As father worked on his translation of PRASNA MARGA, an important and highly authoritative work from Kerala and which is in Sanskrit, I helped him by editing the translation and preparing the notes and illustrations for it. Likewise, also with the editing of the magazine articles. I started the feature Astrological Miscellany in the 1970’s and it proved very popular with the readers and continues to do so even now. I also started contributing articles for our magazine from late 1972 itself, sometimes under a penname. My first editorial was in the early eighties and thereafter, father let me write most of the editorials, including those on political and mundane matters while he confined his to writing to his experiences in astrology. Charlotte: Would you care to comment on what planets are so special concerning the “parents” part of your own chart? We want to get to know a little about you through your chart, if that’s okay. the fact I was moving into the 20-year Venus Dasa, Venus ruling father and mother respectively as 9th and 4th lord, could also be the reason for the kind of parents I had. It also, I believe, brought in a connection between my work and father’s life and work (9th lord in the 10th). Charlotte: As a child, did you understand how distinguished your father was? You must have witnessed some interesting activities, with important people coming to consult with your father at your home. Was it like a master class for Jyotisha in your own living room? 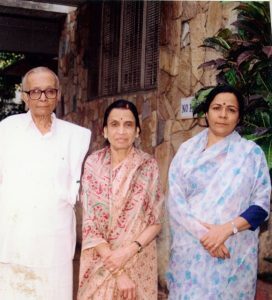 Gayatri Devi: Yes, there were always lots of important people coming to see father. Mother would make coffee for them and it was my duty to serve the coffee to them and this continued till father’s death in December 1998. At the same time, father would ask me to stay in the room while he was talking to them. And I would listen to his astrological explanations which fascinated me. Initially, I did not understand the importance of these meetings but by the time I was in my teens, I could make out they were all VIP’s because, many times, the police would come and check the premises with their dogs for security reasons before these important political leaders came. Charlotte: And now you’re carrying on Dr. Raman’s important work of offering intelligent, legitimate Jyotisha to the public forum. How is it going with Modern Astrology magazine? I love to receive it in the mail, with an Indian stamp, and to read your collections of really substantial and accurate articles about Jyotisha. and attention. She passed away on July 19, 2008. During this entire period, I was not able to do any astrology work. After her death, I got down to working on reviving The Astrological Magazine under the name Modern Astrology. Today, I am glad to say, it occupies the same preeminent position as The Astrological Magazine did in our country and around the world. Charlotte: I read in a book of tributes to your father that he used some interesting techniques to manage your large family. We would love to know about a cherished memory you have of your father, as you were growing up. Gayatri Devi: Anyone who has a large family will know it is no easy task managing a brood of 8 children each separated from the next by one and a half to two years. Naturally, both father and mother may have evolved some strategies to run the family and also balance the varying temperaments in it though I cannot say how they did it because neither let the other down at any time in even the most trifling of things. When an outing was planned, to get us all ready on time and leave on time could, for instance, has been a major challenge. I recall an interesting incident in this regard. Father was a sticker for punctuality. He always took care to see he was never late for meetings, appointments and other time-scheduled plans. Mother was equally so but with eight of us trailing behind her, sometimes it was quite impossible to get us all ready on time. our way. Everyone in the car was keen to watch the sunrise and when even after thirty minutes’ driving, we could see no signs of the dawn; some of us started getting restless. Father who was in the front seat was quietly chuckling to himself. I thought it was time to shake him out of his complacence. “Does anyone here know we started at five o’ clock and that there is plenty of time for the sunrise? And also that father put the clock back by one hour?” I cried out. Father was taken by surprise. He hadn’t expected to be caught, anyway not by his little girl. Charlotte: If you could name one principle about Jyotisha, which you learned from observing your father at work, what would that be? Gayatri Devi: Father always stressed on Jupiter’s position in a Kendra or quadrant (1st, 4th, 7th and 10th houses) as capable of providing relief no matter how strong an affliction was, whether it was a natal or horary or Muhurta chart. Secondly, he discouraged fatalistic interpretations of the chart and emphasized the need to highlight the role of free-will and effort even in the worst of cases. These guidelines from him have been with me throughout my career of 40 years in astrology inspiring and showing me the way while interpreting charts. Charlotte: In May of this year, you had the distinct honor to light the ceremonial lamp which signaled the opening of United Astrology Conference in New Orleans. I feel that Dr. Raman would have been very pleased, and proud of his daughter. I heard from the many people there who attended your lectures, that you were a real inspiration to their studies of Jyotisha. Thank you for making the effort to be there, and to present your important findings to us sincere students. And congratulations on the awards you received, from ACVA, and CVA. Now that you are back from your speaking engagements in the U.S., what else is on your agenda in the future? Gayatri Devi: It was an honor for me to light the lamp to mark the opening of the conference. I feel the invitation to me to light the lamp was really more of an honor to father and the work he did in Vedic astrology because the organizers gave the Vedic astrology community which I was representing this privilege. I am glad my lectures were well received but I feel the credit for it should go to father for it was him who has made me what I am today. The ACVA and the CVA will go down in history as pioneers in the spread and propagation of Jyotisha in the Western hemisphere. And were father to be alive today, nothing would have gladdened him more than to see the momentum the spread of Jyotisha has gathered in the West. Modern Astrology magazine continues to keep me very busy and being a print edition; it is hard and heavy work all the way. I shall soon be getting down to work on January 2013 Annual editorial which takes at least 5 to 6 months to take final shape as WORLD TRENDS AND TENSIONS IN 2013-2014. Finally, I would like to share a few more details with you. Father was very strongly against commercializing astrology and exploitative practices in the name of astrology. He said one could charge a reasonable fee but never something that can be called excessive and in cases, where the consultees were not in a position to pay even a modest sum, they should not be turned away for that reason. An astrologer must always safeguard his self-respect and never solicit favors from anyone. Priyam cha nanrutham bruyat esha dharmahah sanatanahah (Speak not what is false even if it is pleasant. This is the eternal law of Dharma). Like many great souls in the past who were not recognized by their contemporaries but posterity paid them generous encomiums for their contribution to humanity and making the world a little more peaceful place, my father Dr. B.V. Raman’s work too will be recognized by posterity and with that Jyotisha or Vedic Astrology will enter the mainstream educational curriculum in the next few decades. His work will never die. Thank you Charlotte, for giving me this opportunity to share a few words on father with your readers. Remember both Christina and you are as much daughters of the Father of Modern Astrology as I am. For a teacher in India, the student is like his own son or daughter. Father would have been very happy to see the good work you are doing and I believe his blessings are there on you as much as on me. Charlotte: I’m honored, as I’m sure Christina is, to be carrying on, in even a small way your father’s legacy, here in the west. Thank you again for giving us the privilege of getting to know a bit more about you, and for keeping alive the memory of this great man, and astrologer, your father, Dr. B.V. Raman.